For the past couple of weeks I've mourned the end of summer...just seven weeks of 80+ degree weather felt like such a teaser! Oh, but I savored it and am satisfied with how much we enjoyed the gloriously warm days when the Pacific Northwest felt like the best place on earth. And all that freezer jam is keeping me company along the way...can't complain about that! Here in Seattle, Autumn quickly made her presence known last week...she was just two days late. And all of a sudden all I can think about is picking apples and making soup on a blustery day. There will definitely be a change in theme on next week's menu.. 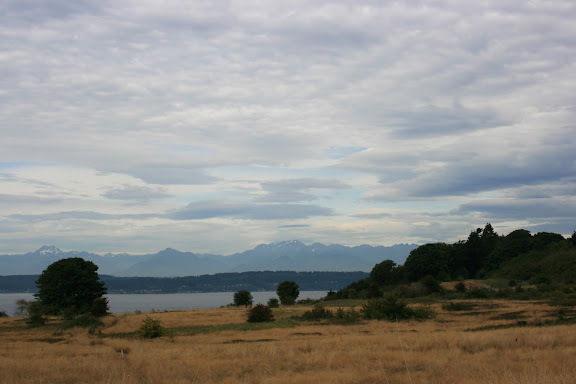 The day before the solstice, I went on morning jaunt through Discovery Park (a massive, protected area just minutes from our home) with my visiting dad and stepmom. This park represents one of our favorite things about living in Magnolia, and I still can't believe a place like this exists in the city. We picked, and then ate, wild blackberries growing throughout the park (hello breakfast!). I even hopped on my dad's shoulders to snag a few bunches that were unreachable...it was great to feel like a kid again for five minutes. I've recently noticed that here in Washington, wild blackberries grow everywhere...even next to the parking lot at the 7-11. No joke! What are some of your favorite traditions in the Autumn? I want to make sure I take advantage of this beautiful season and would love to hear what you do personally. Any and all tips welcome! My sister lives in Seattle (Greenlake area) and takes her family each year to a self pick pumpkin patch. I think it's a nice little drive too, I'll ask her about it and get back to you. My favorite thing about fall- sleeping with the windows open, finally. I love your posts about Washington (and France, of course!). They excite me for my eventually move to Seattle in a few months. Thanks for posting such beautiful pictures and words.